I've done a fair bit of travelling over the last couple of years and one of the things that I love to do is to find a LYS and to see what they have to offer. On-line shopping is fine but nothing compares to being able to hold the yarn in your own hands and see the colour yourself! The discovery of a new LYS is somewhat of a gambit. Sometimes you find a small selection of novelty and cotton dish cloth yarns with some plastic needles on a round rack. Sometimes you find a treasure trove of exclusive colourways or yarns you've only ever seen on-line or in magazines. Usually it is somewhere in between. The joy of a good yarn store is to broaden your horizons and to inspire you with different colours or textures. A good yarn store doesn't have to be a big place. After all, you can fit a lot of yarn into a small space if you have to! My idea of a good yarn store is one with a large selection of a variety of yarns and in a variety of colours. You can so often tell the colour preferences of the yarn shop owner by what is displayed about the store. A good store, in my humble opinion, offers a broad palette of colour options. 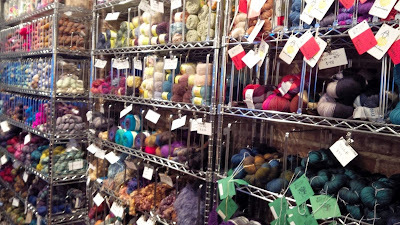 While in New York City last week I visited 3 of the best yarn stores I have ever seen! I had only planned to visit one store while in New York and I had chose Purl Soho, top picture above. It was a bright and colourful store. Now that is an impressive colour palette! I loved the atmosphere and the way the yarn was displayed. It was like jumping into a impressionistic picture of colour. You had to step back to see the big picture but the close-up view was a happy blur. The staff were exceptionally friendly and helpful. I bought some gorgeous worsted weight wool made by the Swans Island Yarn Company. A Maine company with a commitment to high quality. I also bought some yarn to make the Simple Pleasures Hat. This is a hat , presumably, designed by someone who works at Purl Soho. I thought that was a good keepsake of the trip. I loved that they offered to wind all of the wool that I bought for me immediately. I hadn't expected to have the time to find any more stores but my travels brought us near enough to the iconic The Yarn Company, that it would have been foolish to have walked on by without a quick peek inside. 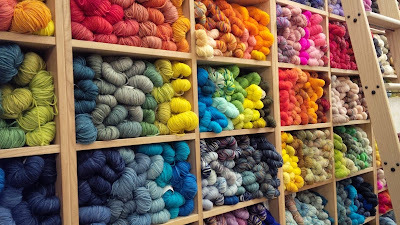 This store is now run by a brother-sister team and this famous yarn shop is full of exclusive colourways and unique yarn. One of the owners asked if I wanted a tour and then proceeded to show me, shelf by shelf, what her store had that others did not. 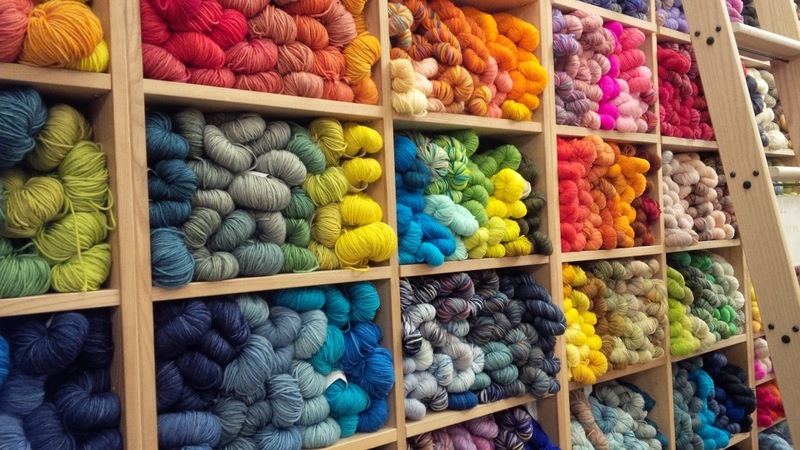 What I saw was a commitment to independent dyers, designers and specialty yarn. The selection of "the good stuff" was almost overwhelming. The owners personally knew and had collaborated with many big name knitwear designers and had the yarn selection to support that. I tried to buy exclusives only but walked away with a small bag of treasures all the same. My last store visited was a complete fluke but a very happy one! I popped out of a restaurant and was waiting for the rest of my party to come out of a small shop next door when my husband spotted a sign that said Annie & Co Knitting and needlepoint. I skipped down the street and was mesmerized by the impressive colour selection of Madelinetosh yarns. This was a very cozy and welcoming store. You got the impression that the staff would sit you right down and chat with you, if given the option. I didn't walk away from that store empty handed either. Yarn is such a tactile pleasure and one that so many people do not fully appreciate until you have the choice between a soft scarf and one made of scratchy wool at your neck. In one of the stores one of my friends, who doesn't knit, whispered quietly to my husband "Did you know that yarn was so expensive?" My husband replied wryly "Did you expect her to like the cheap stuff?" The friend, holding a tiny skein of 100% cashmere in his hand with his eyebrows to the sky at the price said "No wonder she says nothing at all about your comic book collection. She's in no position to complain." My husband smiled slyly and said "Exactly. You'd better find a seat, she could be a while."